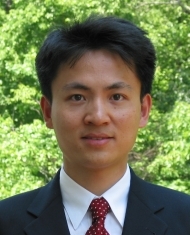 Yuguo Chen is Professor at Department of Statistics , University of Illinois at Urbana-Champaign. He is also affiliated with Department of Computer Science, Information Trust Institute, Computational Science and Engineering, and Illinois Informatics Institute. Prior to joining UIUC, he was an Assistant Professor at the Institute of Statistics and Decision Sciences, Duke University, from 2001 to 2005. 2001, Ph.D., Statistics, Stanford University. 1997, B.S., Mathematics, University of Science and Technology of China. Associate Editor, Journal of American Statistical Association, 2014-present. Associate Editor, Journal of Computational and Graphical Statistics, 2007-2017. Editorial Board, Journal of Algebraic Statistics, 2009-present. Editorial Board, ISRN Computational Mathematics, 2011-present.